If content is king on the internet, video is the undisputed queen. In this article, we illustrate how simple it is to embed video within your WordPress content. Any guesses as to what statistic these numbers correlate to? These numbers describe the amount of YouTube video content consumed every day around the world. That accounts for half of all video content of every format (YouTube, OOTs such as Netflix and Hulu, cable television, etc.) consumed every day around the globe. Still in its relative infancy compared to all other things internet, online video has quickly and dominantly established its position as our favorite way of consuming content online. These staggering numbers aren’t limited to funny cat videos or Breaking Bad episodes. In our most recent WP Courseware user survey, one of the questions we included asked our respondents to indicate their primary mode of training delivery. We received several hundred responses and we weren’t surprised when we analyzed that question in detail. We found that 92% of our WP Courseware users rely on video as their primary training modality in their online course. 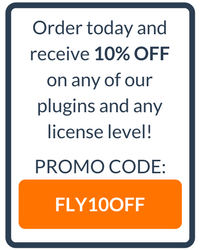 May of our new WP Courseware users purchase our learning management system plugin as a way to gain complete control of their online training environment. Sometimes they’re simply fed up with sharing their profits with online course marketplaces like Udemy. Other times they’re transitioning from a hosted service like Teachable or Thinkific so they can keep their online course offerings in-house along with the other components of their blog or business. In any event, many of our new WP Courseware customers are also new to WordPress. And while WordPress is an incredibly powerful CMS for building your own website, it does have a bit of a learning curve. 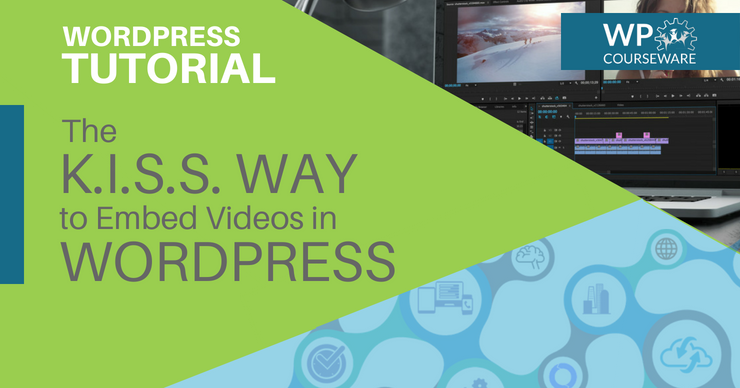 In this article, we wanted to share the simplest way for new WordPress users to embed video content in WordPress posts or pages…and WP Courseware course units. If your blog or website is built with WordPress, and you'd like to feature a video from YouTube or Vimeo in one of your posts, pages, or course lessons, there are a number of options for doing so. Each of these methods have their own pros and cons. For example, our S3 Media Maestro plugin is designed to allow you to host your video files on Amazon’s powerful, yet cost-effective S3 cloud storage platform and then deliver the videos securely from your site so they can’t be shared. However, if you’re building your first online course with WordPress and want to get it created as quickly, easily, and inexpensively as possible (and you’re not worried about preventing unauthorized sharing), your best bet is to simply use the WordPress auto-embed feature. Unlike linking, embedding allows the visitor to play the video without leaving your webpage or website. Embedding doesn't require you to download the video, and upload it to your page, which takes time and requires special software. Embedding allows visitors to share videos on social media easily, so you don't need to have that capability on your own site. It looks better than a link! Embedded videos display a thumbnail and the video's title. Embedding videos on WordPress is really simple! It's set up for easy embedding from YouTube, Vimeo, and many other media sites. You don't need to have any programming knowledge whatsoever. You paste the video URL directly into the post editor. That's it. There's nothing else to it! WordPress uses something called oEmbed to automatically generate the embedded video from the link. Open the YouTube or Vimeo page that contains the video. Copy the URL (the entire thing, including "http" and all) from the top bar in the browser. Another way to do this is to click "Share" and copy the URL from that window instead. On YouTube, the "Share" button is found directly under the video, to the right. On Vimeo, it's the paper airplane icon on the right-hand side of the video. Now open your WordPress dashboard, and open the post you'd like to add the video to, or create a new post. To open an existing post, click "Posts" on the left-hand side, click "All Posts", and then click on the post you'd like to add the video to. To create a new post, click "Posts", and then click "Add New". Once your post editor is open, paste the video URL directly into the text box. Voila! The embedded video appears in the editor automatically, replacing the URL you'd pasted. Just make sure you start a new line before pasting, and make sure the URL isn't hyperlinked. If you haven't published your post previously, click "Preview" on the right-hand column to see a draft of your post. If you have published the post previously, click "Preview Changes". Then, after you've tested the video and made sure it's working correctly, click either "Publish" or "Update". It's also easy to customize the dimensions of your embedded video. You will need to alter the code, but you don't need to know how to program. YouTube and Vimeo will do it for you. In YouTube, click on "Share", underneath the video. Then click "Embed". You'll be able to change the numbers for width and height in the code itself, or customize using the other options. When you're done customizing, select and copy the text in the brackets, including the <>, and paste it into the Visual or Text editor in WordPress. In Vimeo, click on the paper airplane icon on the right-hand side of the video. Then click "+ Show options", next to "Embed", and you'll be given numerous customizable options. When you're done, copy the code, and paste it into WordPress. Embedding video into a post from YouTube or Vimeo is a great introduction to all of the easy customizability options of WordPress sites.